I can vaguely remember as a child watching Alvin and the Chipmunks on tv and they are still going strong today and have changed since they first started out even before I was born. Even though Blake is only 18 months I was excited as it means as he gets a bit older he will be able to enjoy Alvin and the chipmunks too. 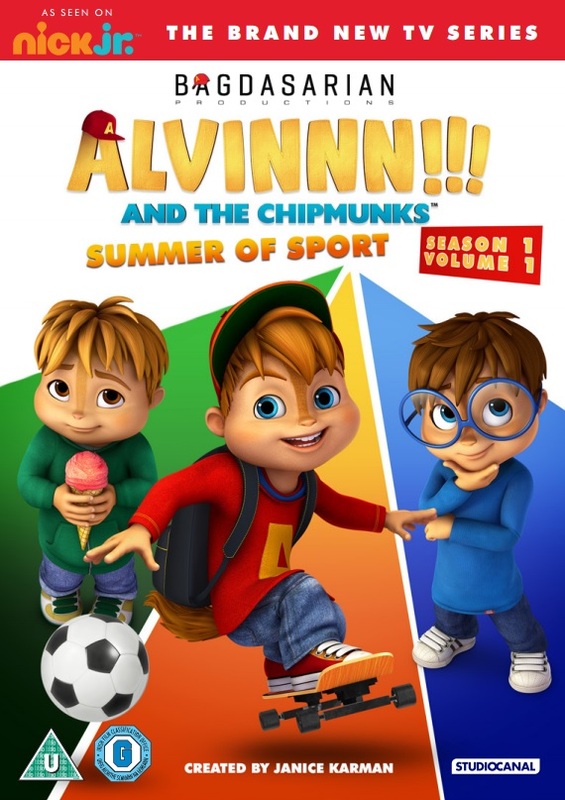 I was more than happy to have a look at the preview of the upcoming DVD release of their computer animated Nick Jr TV series Alvinnn!!! And The Chipmunks. Volume 1, Summer Of Sport, which was released on DVD on June 13th and contains the first 14 episodes from the show. 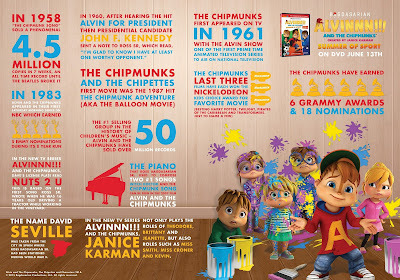 The new animated series Alvinnn!!! and the chipmunks takes us on a roller coaster of a ride with music, laughter and stories. Featuring all of the regular characters, including the guys - Alvin, Simon and Theodore, the Chipettes - Brittany, Jeanette and Eleanor, and their long-suffering carer David Seville. Like most parents David's patience will be pushed to the limit forcing him to end most sentances with "Alvinnn!!!" On watching the DVD the first thing I noticed was how different the chipmunks look and how more human and less animal they are. With the change of how the chipmunks look it places David as a single parent in charge of their care. The story lines are easy to follow and will be enjoyable for older children from about 5 years and over. Blake has no interest yet but I'll definitely be keeping the copy until he is at the right age. ALVINNN!!! AND THE CHIPMUNKS: SUMMER OF SPORT was realesed on DVD on 13TH JUNE 2016. Now why not check out how far the chipmunks have come over the years with this infographic below. I caught an episode of Alvin and the chipmunks earlier today and the sound exactly the same! Graphics are much improved though! Gosh Alvin and The Chipmunks what a blast from the past. They have certainly moved on from what I remember! My little fella is Alvin mad! Like crazy for him. Will have to pick up the dvd now. Who can forget Alvin and the Chipmunks, the cutest film ever. I haven't watched this one! I'm not sure I like the new look, but that infographic is great! My goddaughter and her brother used to love Alvin. It's always fun to see things from our childhood come round again! I used to watch the Chipmunks as a child, they really have changed a lot. I'll have to show them to Tyler some time. My little girl loves Alvin! I need to see this. Saw the Dvd in the shop the other day. I caught this the other day and it's very much the same from when I was a kid.